Yesterday I noticed this Baltimore Oriole, Icterus galbula, intent on a few vines. Today I paid closer attention and realized that she is stripping the bark for nesting material. Every year the orioles return and nest nearby. Remember a couple of years back when we looked at nesting robins? A pair has nested again under the deck, very close to the previous nest. I could pull up some decking for photos but this year choose to leave well enough alone. I think baltimore orioles make the coolest nests: from the sack-like shape to the sometimes wierd stuff they find to weave into them. 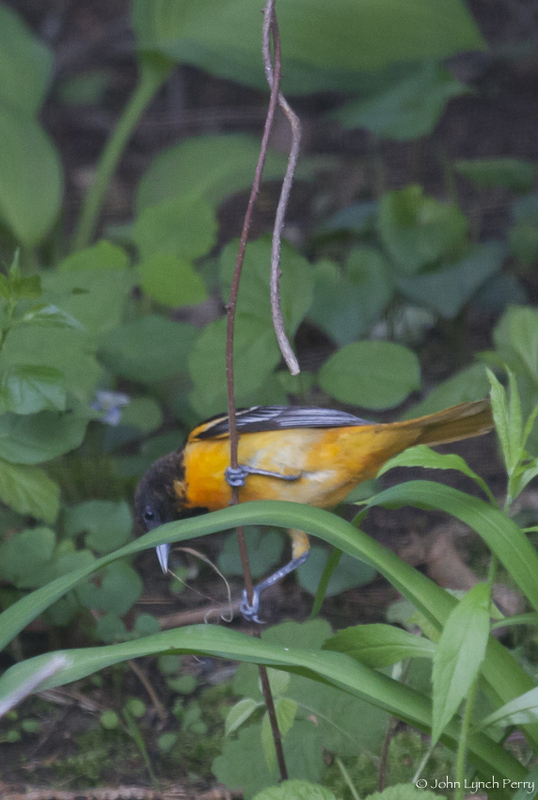 A few years back we had an oriole couple take strips from the plastic blue tarp we used to cover our woodpile. 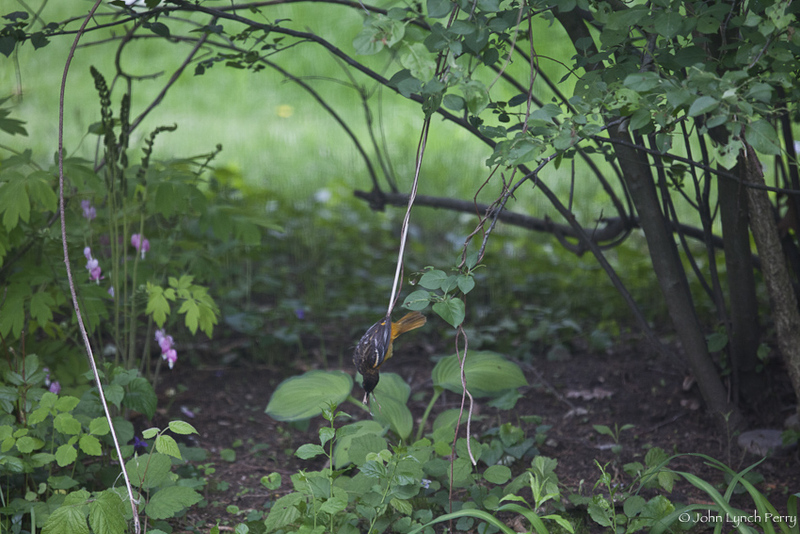 Looked so strange to see an intense blue nest hanging near the tip of our birch tree. It stayed intact for two seasons ( they returned to it ) before being taken down the following winter by an ice storm. I really love the top photo - has the feeling of an Arthur Rackham fairy tale illustration. Don't they make the most ingenious nests? I've had a couple of nests last for two years but not with second year nesting. These photos were with my 100-400 mm. It has such an amazing depth of field quality and even seems to have its own color gamut--all adding up to a most distinctive look of abstraction. It's brutal to lug around, needs tons of light, is difficult at best to handhold, and hard to focus. I still love it!